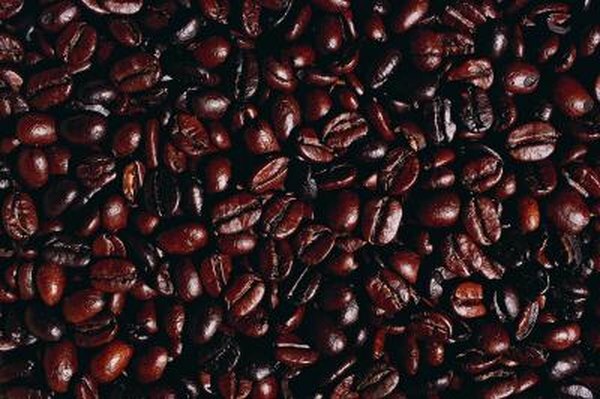 Caffeine, which is found naturally in coffee beans, is classified as a drug. It gives you a burst of energy by stimulating your central nervous system, according to TeensHealth. Understanding how the caffeine in coffee stimulates the body will help you make better-informed decisions about your coffee consumption. Adenosine is a chemical that normally slows down nerve cells in the brain and produces feelings of fatigue. Adenosine and caffeine have a similar structure, and both belong to a chemical group called xanthines. Because caffeine and adenosine are so similar, caffeine can “confuse” adenosine receptors and bind to them in the same way that adenosine does. In the process, it monopolizes adenosine receptors and prevents them from being able to sense the presence of adenosine, according to an article in the February 2003 issue of “American Journal of Physiology." As a result, nerve cells move faster, and you feel alert rather than groggy until the caffeine wears off. Caffeine affects other areas of the body, too. It elevates your pulse, improves your ability to contract some muscles and improves your breathing. One benefit of taking caffeine is it can improve your performance during long and intense exercise sessions. Caffeine makes its way into your bloodstream through your stomach and through your small intestine. Its effects may kick in within about 15 minutes after you drink a cup of coffee and linger in your body for hours, according to the University of Washington’s Neuroscience for Kids website. About half of the caffeine in your body will be gone in about six hours. Your body begins to develop a tolerance for coffee, which means to get that extra burst of energy from your caffeine you will need to continue upping your coffee intake over time. Large doses of caffeine can cause adverse effects such as anxiety, restlessness, tremors, vomiting and insomnia, according to MedlinePlus. About 500 to 600 milligrams of caffeine -- usually more than 3 cups of coffee -- is considered a high intake of caffeine per day. You may be sensitive to smaller amounts of caffeine if you don’t normally have it, if you have a small body frame or if you are young or elderly. Caffeine withdrawal symptoms are another risk to consider. If you’re used to drinking coffee and you abruptly stop, you may get headaches, feel irritable and drowsy, and become nauseated or start vomiting, MedlinePlus warns. Drinking caffeinated coffee can also cause you to lose calcium -- particularly if you drink coffee in the place of milk -- which may result in gradual bone loss over time and increase your risk of osteoporosis. Caffeine may also make certain heart conditions worse, negatively interact with some supplements and medicines, and enhance anxiety and stress. If you want the energy burst from coffee but you want to reduce your risk of side effects, stick to no more than about 300 milligrams a day, recommends the University of Illinois McKinley Health Center. If you want to quit your coffee habit or you are trying to cut back on caffeine, use some caffeine-free methods to boost your energy. For example, sleep until well-rested every night, take a 10-minute speed walk at lunch break to get your blood pumping, and emphasize slow-releasing carbohydrates over simple sugars and refined carbohydrates to reduce your risk of dramatic blood sugar dips. University of Illinois McKinley Health Center: What Are the Effects of Caffeine?